Britain’s Libby Clegg and her guide runner Chris Clarke completed a sprint double at the Rio Paralympic Games on Tuesday, breaking the Paralympic record to add T11 200m gold to her 100m title claimed four days before. Clegg, who only started working with GB international and 20.22 200m man Clarke in February, kept her composure after home favourite and three-time Paralympic gold medallist Guilhermina Terezinha was disqualified for a false start. The Briton went on to clock 24.51 ahead of China’s four-time 2015 world gold medallist Cuiqing Liu with 24.85 and London 2012 T12 100m champion Zhou Guohua with a 24.99 PB for her second Paralympic gold after T12 100m silver medals at both Beijing 2008 and London 2012. Like Zhou, visually impaired sprinter Clegg was reclassified from a T12 to T11 athlete only earlier this year, which means she must now wear a blindfold to compete. Despite the changes in 2016, together with the fact that she was forced to withdraw from last year’s IPC World Championships through injury and just 10 months ago also lost her Lottery funding, Clegg has been in the form of her life. She went into the Games as the 200m world record-holder, the 26-year-old in July having taken 0.23 off a mark which had been set by Guilhermina in 2012, and Clegg is now the world record-holder for both events after also lowing the 100m mark to 11.91 in her semi-final in Rio. Speaking with AW ahead of the Games, Clarke explained how Clegg “should be aiming for double gold” and their hard work over the past few months paid off as they achieved that goal even though Clarke had suffered illness in the days leading up to the final. “It is a dream come true. I am absolutely over the moon,” said Clegg. “The 200m is actually my better event and I love it so I’m so happy that we took the gold in this one. 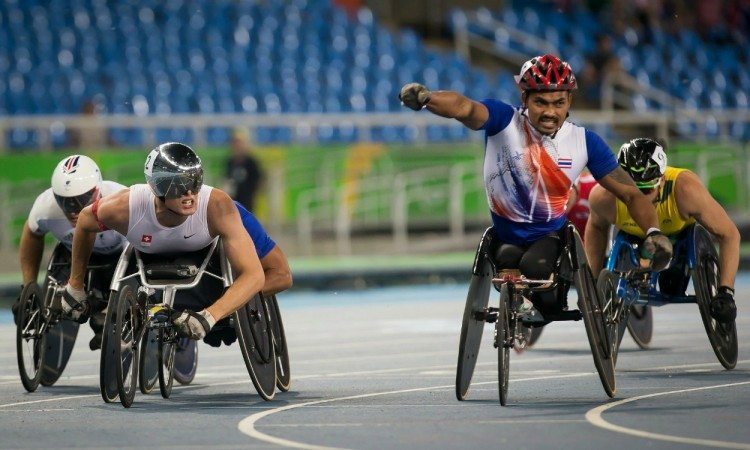 Britain’s six-time Paralympic gold medallist David Weir contests five events in Rio and the wheelchair athlete remains on the hunt for a podium place after finishing just outside the medals as he defended his T54 1500m title. After his fifth-place finish in the 400m, Weir clocked 3:01.08 to finish behind Thailand’s 5000m champion Prawat Wahoram with a winning time of 3:00.62, Switzerland’s world record-holder Marcel Hug with 3:00.65 and Wahoram’s team-mate Saichon Konje with 3:00.86. USA’s Tatyana McFadden broke the Paralympic record to lead a US 1-2-3 in the T54 1500m, the triple London 2012 champion claiming her second gold in Rio and her third medal so far as she targets seven medals in Brazil in total. In a close finish, wheelchair racer McFadden clocked 3:22.50 to beat Amanda McGrory with 3:22.61 and Chelsea McClammer with a 3:22.67 PB. Switzerland’s Manuela Schar was fourth in 3:23.41. 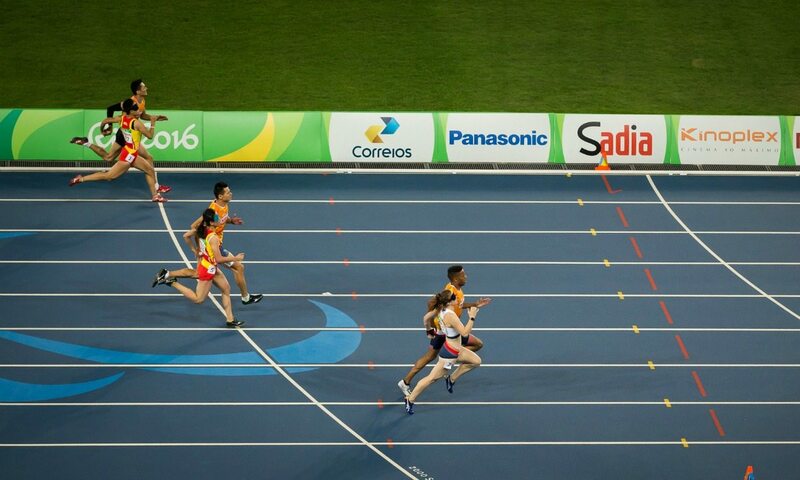 Kenya’s Samwel Mushai Kimani added T11 1500m gold to his 5000m title, the visually impaired runner clocking 4:03.25 for victory ahead of home favourite Odair Santos, who also claimed 5000m silver behind the Kenyan, while USA’s Breanna Clark missed the T20 400m world record by just 0.01 with a time of 57.79 to get gold ahead of Ukraine’s Natalia Iezlovetska with 58.48 and Poland’s triple 2015 world champion Barbara Niewiedzial with 58.51. Nigeria’s Flora Ugwunwa broke the F54 javelin world record with her first throw of 20.25m, adding more than a metre to the record which had been set by Tunisia’s Hania Aidi in Doha last year. Aidi responded by throwing a 18.88m PB in the third round but it wasn’t enough to take the title ahead of Ugwunwa. The men’s F46 javelin title was claimed by India’s 2004 champion Devendra Jhajharia, who improved his own world record set 12 years ago to 63.97m get another gold ahead of China’s Chunliang Guo with 59.93m and Sri Lanka’s Dinesh Priyantha Herath Herath Mudiyanselage with a 58.23m PB. Germany’s Franziska Liebhardt improved her own F37 shot put world record to 13.96m in the first round of the competition and couldn’t be beaten as the 34-year-old, who also contests the long jump in Rio, added 14cm to her previous best to take the title ahead of China’s Paralympic record-holder Mi Na with a regional record throw of 13.73m. Ukraine’s T12 long jump world record-holder Oksana Zubkovska, who won Paralympic gold in Beijing and London as well as a world title in Doha last year, added to her gold medal collection as she leapt 6.09m in the first round and improved to 6.11m in the last.